Shown are a set of deployed airbags in a wrecked 2006 Ford Ranger at Reno’s Auto Parts on U.S. 50 west of Hillsboro. This model is included in a nationwide recall of Takata airbags. That card or letter in your mailbox that looks like junk mail warning of defective airbags could possibly save a life. The mailers, with a return address of only a city and box number, outline an airbag defect that according to the National Highway Traffic Safety Administration has killed 16 people in the U.S. and caused more than 200 injuries. As a result, car dealerships, including some in Hillsboro, are required to replace the recalled parts for free, according to the NHTSA. Honda announced on March 29 a confirmed death in the United States due to a defective Takata airbag inflator that resulted from a crash involving a 2002 Honda Civic last year in Arizona, the first additional death to be confirmed since 2017. Honda vehicles have been involved in 14 of the fatalities, with the other two happening in Ford vehicles, according to the NHTSA. Bill Liermann, the service manager for Jerry Haag Motors in Hillsboro, told The Times-Gazette that the dealership has received what he described as a handful of recall notices in the past year. Liermann said that once a person receives a recall notice and calls the dealership, the process of getting the repairs done is a fairly straightforward, beginning with ordering parts and scheduling a convenient time for repair. Currently, 50 million airbags are under recall, affecting about 37 million vehicles, according to the NHTSA. 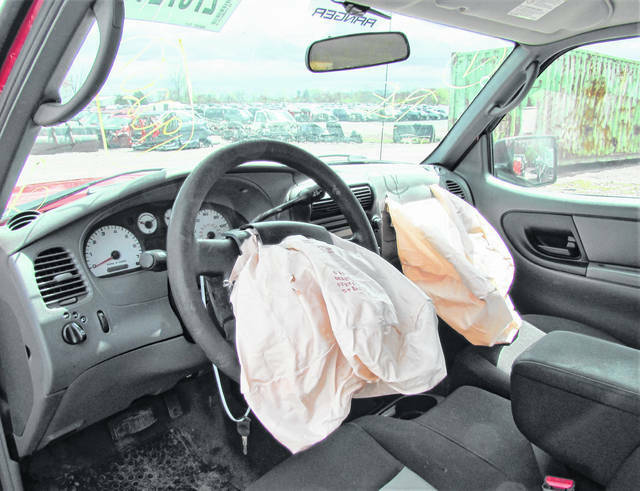 The NHTSA said that when subjected to years of exposure to humidity, breakdowns in the ammonium nitrate used in Takata’s inflators can cause them to rupture with too much force during an airbag deployment, ejecting what amounts to shrapnel into the cabin. The problem has spawned the largest automotive recall in U.S. history, with the NHTSA saying that there were 56 million defective inflators in use on 2000 to 2018 model year vehicles. Auto dealers are required to install replacement inflators for free, according to the NHTSA. The NHTSA said that as of Dec. 31, 2018, all original inflators in all regions are under recall, regardless of vehicle age, and on New Year’s Eve 2019, automakers will recall all replacement Takata ammonium-nitrate inflators installed in some vehicles as a stopgap measure due to the humidity issue, with inflators that employ a different chemical. As the manufacturer of the supplemental restraint system, Takata pleaded guilty in 2017 to fraud charges in the U.S. for hiding the defect for years and agreed to pay $1 billion in criminal penalties, in addition to $180 million in regulatory fines and penalties, according to the NHTSA. Also that year, prosecuting attorneys in Detroit charged three former senior Takata executives with falsifying test results to conceal the inflator defect, the NHTSA said. However, it is unlikely that any of them will come to the United States to face charges. A New York Times report suggested that Takata knew about the airbag issues as early as 2004, conducting secret tests outside of work hours to verify the problem. The results confirmed major issues with the inflators and engineers quickly began researching a solution, the Times said, but instead of notifying federal safety regulators and moving forward with fixes, Takata executives ordered its engineers to destroy the data and dispose of the physical evidence. The Times alleged that this occurred four years before Takata publicly acknowledged the problem, which they did in 2008. More than one-third of the recalls involve Honda or Acura vehicles, which though it has the largest number of vehicles in the recall also has the highest number of recall repair completions at 71 percent, compared to a 57 percent completion rate for the auto industry as a whole, according to the NHTSA. If drivers have not received a recall notice in the mail, they can see if their vehicle is under recall by going to www.nhtsa.gov/recalls and entering their vehicle identification number.